Bellringers and spouses from Willingham and the surrounding area worked flat out during the month of August 2008 to carry out the refurbishment of Willingham’s bells. 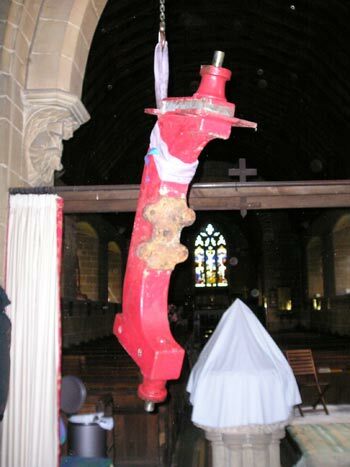 On August 1st the local ringers got started by degreasing and cleaning the bell frame. 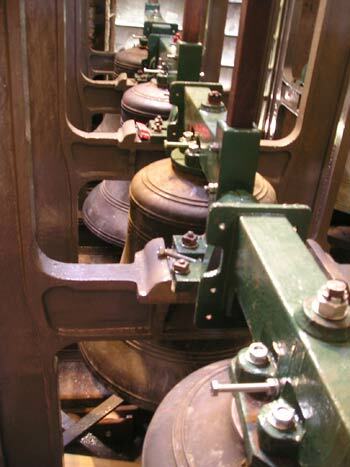 On the next day a team of 6 more experienced ringers worked extremely hard all day to remove the bells’ clappers, wheels and headstocks, lowering them to the church floor through the trap doors, ready for them to go to the bellhangers’ works in Nottingham. The next three weeks were spent putting three coats of paint on the frame (a lot went on the painters too) and covering the louvres on the inside with thick wooden boards so that the sound of the bells would go out of the lantern at the top of the tower rather than out of the louvres. Meanwhile, in Nottingham the clappers were reshaped, the headstocks altered so that the bells are now hung on ball bearings, and the wheels overhauled and coated with preservative. On August 22nd the fittings returned to the tower and a large team of volunteers reassembled the bells, all the pieces being hauled back up the tower using pulley chains. Work was also carried out on the roof and sound lantern to make sure that these keep the elements and birds out of the tower. It was a huge task. Some 450 volunteer hours went into this major project. We are immensely grateful to Tom Blyth, our young bellhanger from Saxilby who worked tremendously hard and was very patient with the volunteers. All the volunteers feel rightly proud that their work will ensure that the bells are in excellent condition for the next 100 years. This refurbishment was only possible due to the amazing amount of generosity from villagers and grant making bodies and to the hard work of the local bellringers, their friends and families. A peal was rung in 2006 to mark the centenary of the installation of Willingham, St Helen’s six bells. It had always been the intention to get a peal board made to commemorate this peal but the plan was shelved when it became apparent that the bells were going to be in need of a costly overhaul. This rehanging and refurbishment took place in August 2008 following many fundraising activities by the local ringers. 2009 saw the Golden Wedding anniversary of Doreen and Derek Hancock. Doreen has been a member of the Willingham band for about 4 years now and she thought that it would be nice to mark their wedding anniversary with a peal board and offered a very generous donation towards one. It was decided that another peal was needed to celebrate this wonderful occasion and was the first peal on the bells since the rehang. So now we needed two peal boards. Following the Sermon and dedication, the young ringers rang “Holy, Holy, Holy” and the Ringers’ Hymn on handbells. Bell shaped biscuits were enjoyed with the coffee after the service. Many of the people whose names appear on the peal boards (clergy and churchwardens as well as ringers) were able to be present at the dedication and it was a real thrill to know that we have added a little to the living history of the church.